We went to Spain last month for a family holiday (you can see more photos from our holiday here). One of the highlights was a day trip to Barcelona. I’d visited Barcelona for a few days with friends when I was a student, but Laurie hadn’t been before. We met up with my parents in Barcelona, it was the first time we’d seen them in months as they’d been busy traveling around Spain and Portugal in their motorhome. When we were arranging the trip, I asked my dad to look online to see if he could find details of a vegan ice cream place in Barcelona. We didn’t have internet access on holiday, and I didn’t want it - it’s so nice having a break from the stresses of work-related emails for a while. My dad later told me he thought it was a ridiculous thing to Google, and was sure it wouldn’t find anything useful. But it did! We got the bus to Barcelona and met my parents near the bus stop. They were so excited to see Ebony, it took a while for them to notice me and Laurie! We made our way towards the Cathedral, and tried to decide whether to go in or not. Our bus had taken a while, and Ebony had been so good, that we sort of felt she deserved some fun, and probably wouldn’t have wanted to walk calmly round a cathedral. So, after a quick run around in the open space in front of the Cathedral, we set off in search of vegan ice cream. A short walk around the busy, narrow streets led us to our destination - Gelaaato Di Marco. According to the internet, it was a gelato shop that had a few vegan options (they also had gluten free cones) available, but you can never be too sure how reliable the internet is. We left Ebony outside with my parents, because I thought it would be too awful for her to see ice cream and then not be able to have one if they didn’t have any vegan ones on sale. But they did! And they had a ‘Friend to the Animals’ award on the wall, which I thought was pretty awesome. They had four different vegan ice cream flavours to choose from - one made from coconut, and a couple from rice milk. They had chocolate, coconut, vanilla and cinnamon ice cream. We got Ebony a small cone of the coconut ice cream because she coconut is one of her favourite foods. I had two scoops; one coconut and one chocolate, and Laurie decided to have vanilla, chocolate and cinnamon. The ice cream was so good. 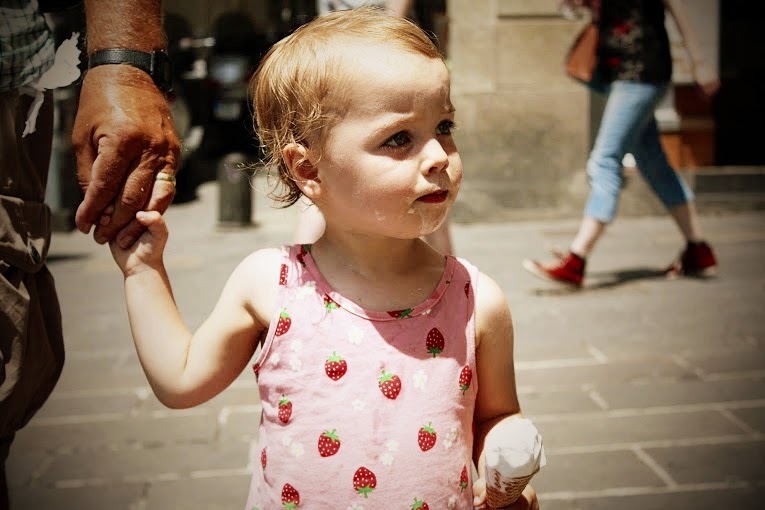 I spent the rest of the holiday arguing with myself about whether it was worth going all the way back to Barcelona just to get another ice cream (it was, but we didn’t). When we left the shop, Ebony looked excited to see a vegan ice cream headed her way. One of the perils of a vegan childhood is that she hasn’t yet cottoned on to how fast ice cream melts. There was a lot of mess, quite a bit of stickiness and a few spills, and it was wonderful. 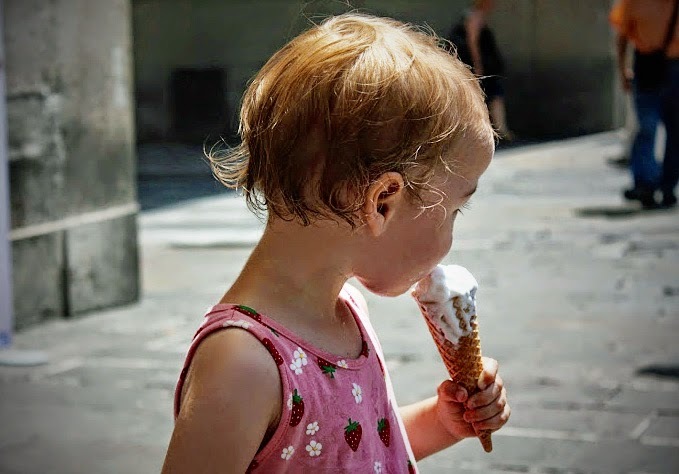 I finally have the photograph of the messy-mouthed ice cream-wielding child to add to my collection.